The FDA has already approved Cannabis-based drugs for medical use. These include drugs developed from cannabinoids to treat medical conditions such as nausea, vomiting and pain. Also, the scientific literature has become replete with articles that testify to the activity of cannabinoids and cannabinoid-like compounds in the treatment of serious diseases, including cancer. The anticancer effects of cannabinoids were first shown in an animal model of lung cancer in 1975. Interest in using cannabinoids for cancer treatment was rekindled in the mid-1990s by a study in animals that indicated that THC decreased the incidence of liver cancer in mice and tumors of the mammary glands, uterus, pituitary glands, testes and the pancreas in rats. Since 2001, interest in the anticancer properties of cannabinoids has increased significantly. In the laboratory, cannabinoids have shown effectiveness against glioma (a type of brain cancer), lymphoma, pancreatic, skin, breast, thyroid, colorectal and prostate cancer cells. In mice, cannabinoids reduced tumor growth and spreading of cancer cells (metastasis). They were also shown to inhibit the growth of new blood vessels required for tumor growth. In 2006, in a small, early-phase clinical trial, THC was shown to be beneficial for patients in treating glioblastoma, a severe and deadly type of brain cancer when safe (non-psychoactive) doses were used. The two most familiar cannabinoids are tetrahydrocannabinol (“THC”) and cannabidiol (“CBD”). While THC is associated with psychotropic effects, CBD is not. Cannabis that is rich in CBD is preferred for medicinal purposes. With an increasing number of states approving the use of Cannabis for medical purposes, a plethora of medical marijuana companies have emerged. Most of these involve the production and distribution of Cannabis in its various forms, such as liquid extracts and pills, as well as Cannabis delivery systems like vapor pens. PharmaCyte’s major competitors for the development of Cannabis-based treatments for cancer are Cannabis Science, Inc. (“CSI”) and GW Pharmaceuticals, Plc. (“GWP”). CSI plans to use complex extracts of Cannabis to develop treatments for basal and squamous cell carcinomas and Kaposi’s sarcoma. GWP is developing a product portfolio of cannabinoid-based prescription medicines. PharmaCyte acquired from Austrianova an exclusive, worldwide license to use the Cell-in-a-Box® technology in combination with genetically modified non-stem cell lines which are designed to activate cannabinoid molecules for development of treatments for diseases and their related symptoms. 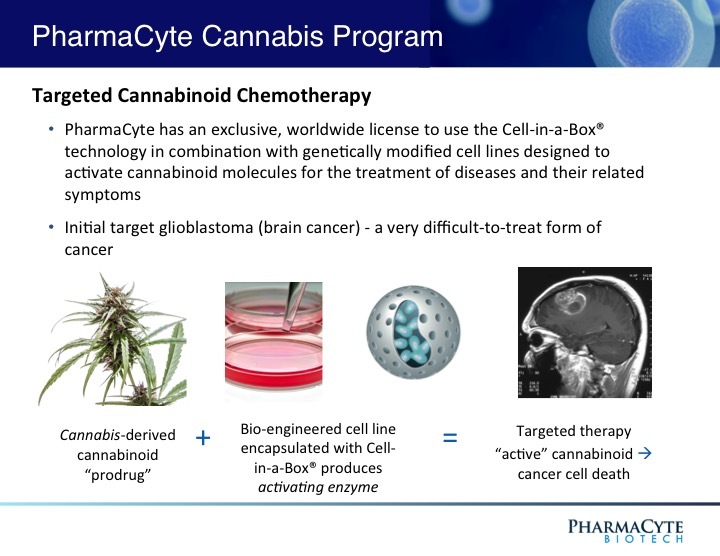 In contrast to the work being done by our competitors, we plan to combine the Cell-in-a-Box® live cell encapsulation technology with cannabinoids to develop a unique therapy for difficult-to-treat and deadly forms of cancer, such as brain cancer. Some cannabinoids are prodrugs that must be converted into their cancer killing form. These prodrugs will be used with the Cell-in-a-Box® technology in ways that optimize their anticancer properties while minimizing or even eliminating adverse side effects that normally occur with chemotherapy to treat cancer. We plan to use cannabinoids (chemical constituents of the Cannabis plant) to develop therapies for cancer, with the initial target being brain cancer. We are focusing on developing specific therapies based on carefully chosen molecules rather than using complex Cannabis extracts. Targeted cannabinoid-based chemotherapy utilizing the Cell-in-a-Box® technology offers a “green” approach to treating solid-tumor malignancies. Here, the methodology of placing a target in proximity to the tumor so that a cancer prodrug can be activated there mimics our efforts with LAPC except that in this case the cancer prodrug will be cannabinoid-derived. To further our Cannabis therapy development plans, we entered into a Research Agreement with the University of Northern Colorado. The initial goal of the ongoing research was to develop methods for the identification, separation and quantification of constituents of Cannabis (some of which are prodrugs) that may be used in combination with the Cell-in-a-Box® technology to treat cancer; this has been accomplished. Subsequent studies have been undertaken to identify the appropriate cell type that can convert the selected cannabinoid prodrugs into metabolites with anticancer activity. Once identified, the genetically modified cells that will produce the appropriate enzyme to convert that prodrug will be encapsulated using the Cell-in-a-Box® technology. 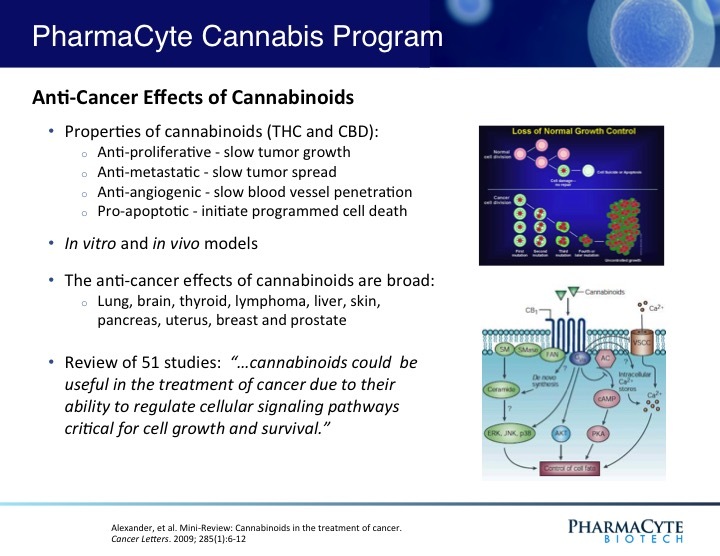 The encapsulated cells and cannabinoid prodrugs identified by these studies will then be combined and used for future studies to evaluate their anticancer effectiveness. We plan to focus initially on developing specific therapies based on carefully chosen cannabinoid molecules rather than using complex Cannabis extracts. An understanding of the chemical and biochemical processes involved in the interaction of substances derived from Cannabis with live cell encapsulation provides the opportunity to develop targeted “green” approaches to treating cancers, such as pancreatic, brain, breast and prostate, among others. We believe we are in a unique position among medical Cannabis and pharmaceutical companies to develop cannabinoid-based therapies utilizing our proprietary Cell-in-a-Box® live-cell encapsulation technology as the platform.